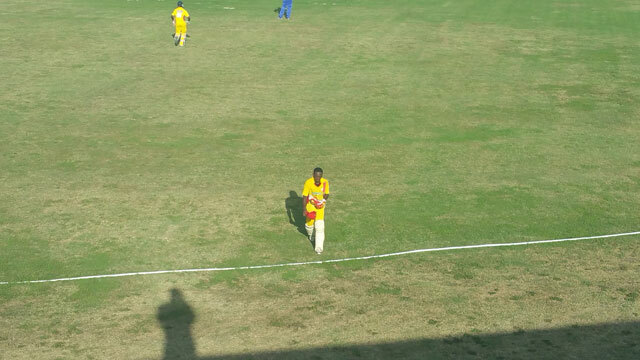 Basseterre, St. Kitts-Xavier Saunders and Elsroy Powell starred with the bat for their respective teams on Sunday in the Keith Arthurton Windsor University Nagico T20 at the Conaree Cricket Field. 18 year old Xavier Saunders powered Molineaux/Cayon to an impressive victory over Haynes Smith with a remarkable 94 as his side posted 221-6. Opening the batting Saunders lost his partner early but teamed up with Jaleel Clarke to put on a partnership of 142 as they frustrated the opposing bowlers while keeping the run rate above 10 runs per over. Saunders and Clarke, both past Leeward Island under 19 cricketers demonstrated class by first seeing off the difficult period before they started regularly finding the boundary. When Mr. Clarke departed for 76, Mr. Saunders continued to power the Molineaux/Cayon innings as he also past his half century. Saunders was then joined by the experienced Larry Audain who looked to launched from the foundation set smashing three 6s and a four on his way to 22 partnered with Saunders as he closed in on a century. Saunders however fell six short of the milestone after playing a tired looking shot. As he left the field he was applauded and given a standing ovation from his teammates and the small gathering at the Conaree Cricket field. In response Haynes Smith made a good effort of chasing the huge total on the back of 45 from Phillip Webbe who displayed his ability to consistently find the boundary. He was also ably supported by R. Balgobin who also reached 42 and were the main cog for Mr. Smith who was bowled out for 184 falling 36 runs short. Earlier on Sunday a century from Elsroy Powell and a half century from Steve Liburd maintained Newtown Cricket Clubs’ winning streak as the destroyed defending champions Sandy Point. Mr. Powell smashed 106 to follow up his 80 last weekend and made the venue seem too small as he smashed boundary after boundary tearing into the Sandy Point bowling attack. Steve Liburd also added 68 as he and Powell carried their side to 259-5 in their 20 overs. In response the defending champs put on another poor batting performance as they were scuttled out for 96 losing by 163 runs. For Newtown Alexis Richards, Akino Gordon and Elsroy Powell all collected two wicket in their route of the defending champions. On Saturday October 22, 2016 Government Road All-stars out of Nevis recorded a six wicket victory over Molineaux/Cayon. Winning the toss and batting first Molineaux posted 137-7 from their 20 overs with Larry Audain top scoring with 30. In response Ross Powell led the charge for the All-stars team with an unbeaten half-century as they reach their target quite comfortably.